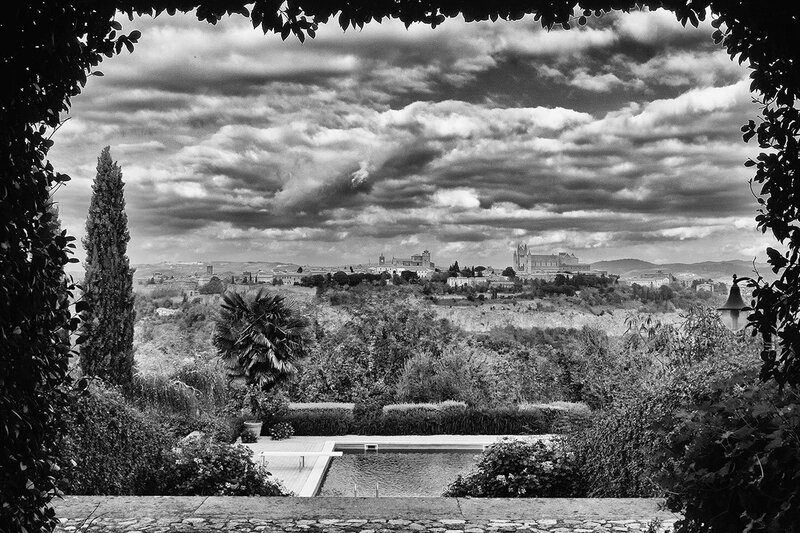 View from the Domenica Fiore Estate. All photos by Nicholas Coleman. 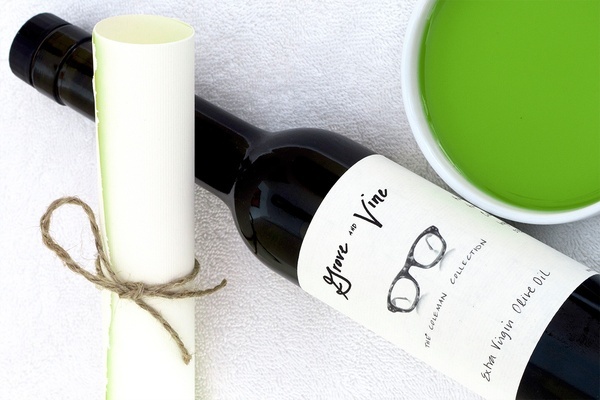 In our 2015 Armchair Traveler holiday gift guide, we featured the new olive oil subscription company Grove and Vine. Here, co-founder Nicholas Coleman describes a day in the life of his EVOO enterprise. ORVIETO, Italy – 7:30 a.m. in Umbria. The cool wind howls through the antique windows at the estate. I have a private suite overlooking the tall swaying cypress trees, the olive groves, and the vineyards into the lush green valley. From my bedroom on a clear day you can see the massive gothic duomo hovering in the distance. But not today. It rained heavily last night, and the legendary Umbrian fog has rolled in and nestled itself in the crevices of the hillside amid the olive groves. Only the church steeples poke through the thin veil of clouds that hang over and engulf the medieval town high upon the hill. The olives will be too damp and moist to harvest early this morning. If the wind keeps blowing, they may be dry by 10 a.m. or so and the ancient annual harvest will resume. 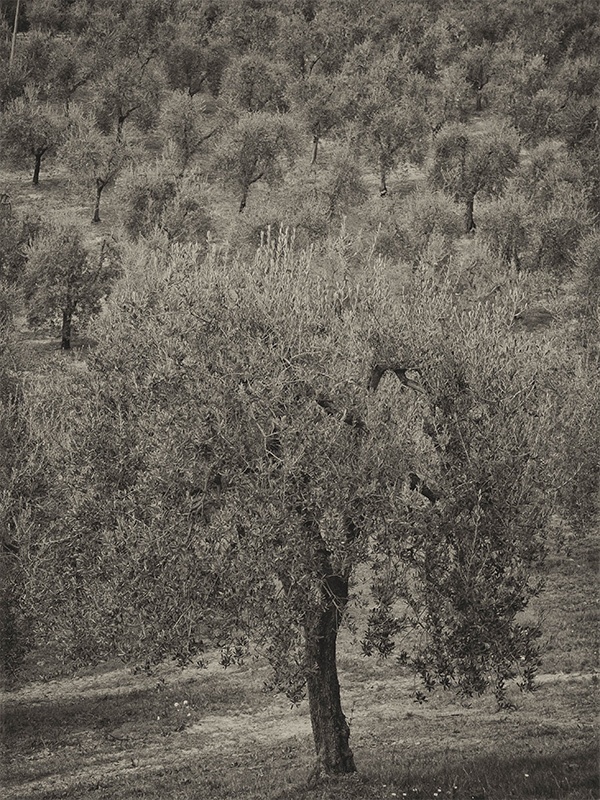 A collection of Canino olive trees speckle the hillside at Domenica Fiore. I'm here on business to design a custom blend of olive oil for my new enterprise , an olive oil subscription service I co-founded with renowned New York City wine guru Dan Amatuzzi. We are committed to delivering the highest quality olive oils from around the world directly to subscribers' doors. For our inaugural release, I have come right to the source and teamed up with the inimitable Umbrian producer Domenica Fiore, winner of numerous awards at, among others, the New York International Olive Oil Competition. I showered, dressed, and hopped down the stairs into the kitchen for an espresso with Cesare Bianchini, the estate's land steward. After a lifetime in farming, he's committed himself to the economic viability of sustainable agriculture. He wanted to bring me to the master holding tanks located at one of their groves. Since the harvest was practically over, he already had a varied selection for me to sample. We drove through the narrow winding streets of Orvieto, past vineyards and olive groves and into the countryside. He took me to his highest elevation property, one protected by sixty hectares of natural forest that serve as a barrier that shelters his organic environment from neighboring vineyards that may be sprayed with pesticides during the hot summer months. There is an old Italian phrase, cio che cresce insieme va di pari passo. "What grows together, goes together." There are so many factors that govern the quality and flavor profile of an oil, and one of them is other things growing in the grove. As we strolled through the trees, I smelled a variety of herbs used as cover crops. They gave off a plethora of pleasant aromas. When I closed my eyes and took a deep breath, the most noticeable was mentuccia, a local herb with a fragrance similar to oregano and mint. By cultivating these herbs throughout the grove, Cesare can influence the subtle aromatic properties of his oil. Olio Nuovo. Freshly pressed oil from Domenica Fiore estate. 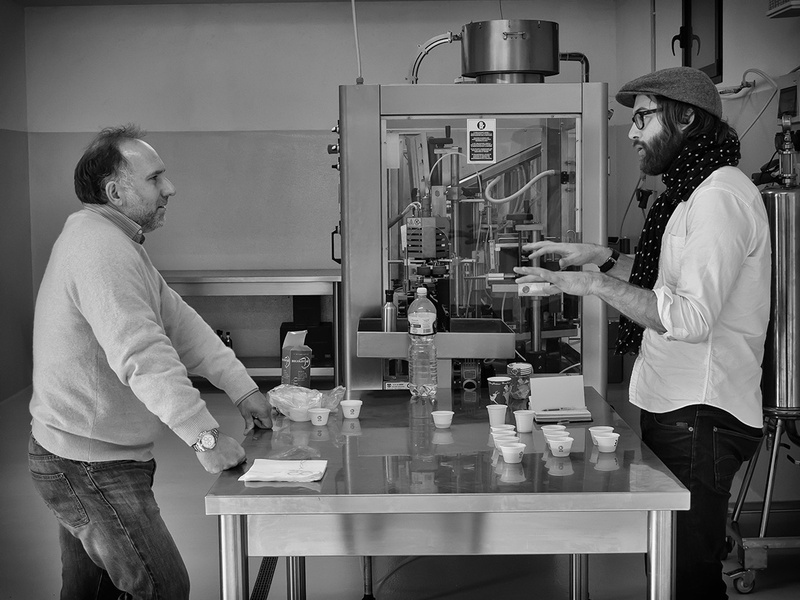 Nicholas and Cesare taste oils to determine the finest selection. Photo by Ineke Bulle. In the center of this grove is the bottling facility, a stone building with a slated roof. Cesare led me into the storage room, which held ten massive, stainless steel tanks. Each tank was from a different grove produced with a particular olive cultivar harvested at a specific time. Producers typically harvest early, in the middle, and late in the season of two months to obtain a wide variety of textures and flavor profiles. Having a variety gives producers the option of blending to create the selected ratio of bitterness and pungency. All olives start their lives green and ripen to a deep purplish black. The color directly reflects the stage of maturation. 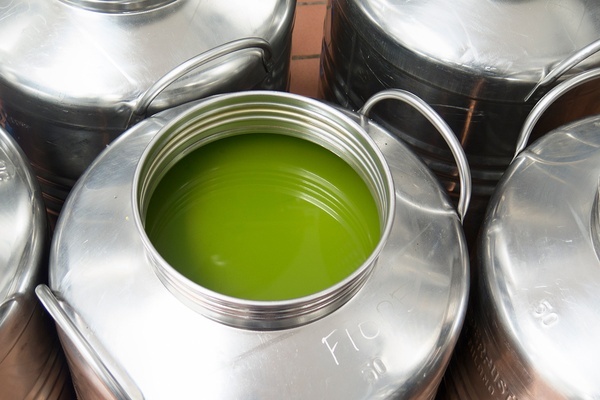 When harvested green, the olive yields less but more vibrant oil — bitter and peppery and high in polyphenols. If harvested later when the olives are dark purple, the oil is more delicate, mellow, and ethereal — and of a higher quantity. Since Grove and Vine will operate on a small scale, I was going for the cream of the crop: a hyper-localized oil from a very small selection of the finest trees with a vibrant, dynamic flavor profile that had all the positive attributes of Class-A oil but was restrained in its bitterness. In other words, I wanted something balanced with pizazz. I left the room while Cesare poured oil into small 2 oz. tasting cups. I didn't want to know which tank they came from. I insisted on tasting the oils blind, without knowing cultivar or price point, to let only my sensory expertise guide me. After analyzing the ten separate tanks, I found myself gravitating to what I later learned was an early hand-harvested monocultivar Canino oil from a single high elevation grove. 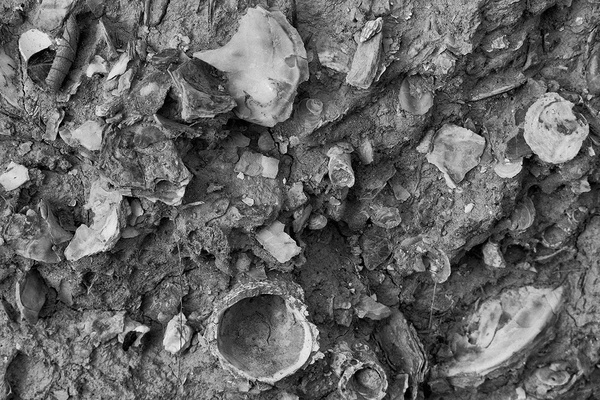 Despite being 500 meters above sea level, the soil is stratificatied with ancient seashells. The Canino olive is a special cultivar grown between the regions of Lazio and Umbria. It is such a small fruit that the pit can sometimes overwhelm the pulp and give a very low yield — between 11 and 13 percent — and it ripens later than other cultivars in the region. The Canino has an interesting flavor profile: It's both complex and balanced with hints of freshly cut grass, almond, artichoke, and a delayed, elongated peppery finish. It was precisely the flavor profile I had in my head! When I began asking questions about the growing conditions and soil, Cesare confirmed why this particular oil had such light, fluid, and fruity characteristics. Four to five million years ago, nearly fifty percent of Italy was underwater. Umbria was actually half underwater, and the town of Orvieto was geographically situated at the shoreline of the sea, on the direct line of seashells which were transported from the deep sea and resulted in many layers of stratification in huge quantities. Today, this unique combination of a loose, sandy seabed atop a high elevation grove, with perfect sun exposition and brisk winds, is the ideal microclimate for growing healthy olives. The key component to enjoying olive oil is ensuring that it's as fresh as possible when served. When you experience the real thing, you will remember exactly where you were, whom you were with, and what you were eating at the time. That's the experience I want to bring to people. The Grove and Vine set. of four custom-blended bottles shipped with tasting notes and food and wine suggestions. Nicholas is the chief oleologist for Eataly NY and the co-founder of . You can follow him on and @oleologist. He travels for the finest olive oil on the planet. Был найден мной классный веб портал , он описывает в статьях про https://best-mining.com.ua.